In order to engage recruits, you must first understand them. When you’re working to engage potential recruits, respect is critical. They need to know that your understanding of a condition and their relationship to it is more than superficial. To prove this, you must dig deep. Who do you want to reach? What are their connections to your study? What will motivate them to participate? You must you speak their language, understand their needs, and approach them with informed empathy. In fact, you may already know a lot about your audience. But to communicate effectively, you need to take a step back and test your assumptions. This might mean eating some humble pie. But the knowledge you gain can create dramatic improvements in recruiting — and change audience perception of your work for the better. If you want to understand people, start with people. This often means collaborating closely with clinicians and physicians, the professionals who work intimately on the front lines with patients and their families. In our work with the Alzheimer’s Prevention Registry, we rely on our researchers as a frontline source of information to help us define recruiting targets, create outreach for harder-to-reach audiences, and even choose visuals for campaigns. We get even more insight by asking users themselves. Early on, we employ user surveys to gather data, both big and small. We might set up a dialogue with half a dozen people on site to get their opinions about how to explain a study’s potential risks and benefits. Or we might survey potential users to get opinions on naming options for a site, as we did with FTD Disorders Registry. Or we could use online data mining to help identify places where people are already finding information or talking about a disease. What are the impacts people mention most? How are people connecting and responding collectively? 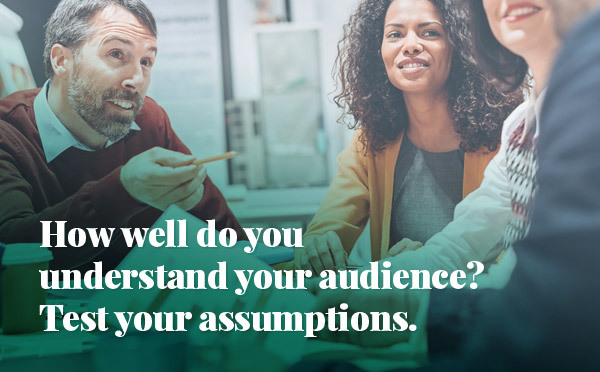 It’s one thing to listen carefully to what your audience says. But it’s also critical to look at what they do. There’s often, it seems, a measurable difference. That’s why Search Engine Optimization (SEO) and Search Engine Marketing (SEM) efforts prove so valuable. SEO reveals how people search for resources related to a condition, and provides clues about their everyday use of language. This helps us improve search results and communicate using words and phrases that increase comfort levels and comprehension. Without data support, we might well have chosen “trial” as our primary term, as it is common in the research community. But respondents preferred “study” by a significant margin. In creating content, then, we leaned heavily on the use of “study,” while employing “trial” periodically for balance. A small choice like this might seem insignificant. But words are important. Keywords form the foundation of all communications efforts—from phone scripts and blog posts to social media, video, and presentation decks. Once an SEO strategy has been developed, early assumptions can be tested using SEM on Google, Bing, or Yahoo. A/B tests can determine a preference for everything from study names and taglines to the phrasing of an invitation to join a study. Once a web framework is assembled we can learn about how our audience engages with it through direct observation. Often, we start with navigation, presenting users with different structural “trees” and page labels. In this case, observation reveals nav system fails, and gives guidance for alterations. When it comes to reviewing video of user tests, Marketade’s John Nicholson points out an important consideration. Allowing the whole team—not just the UX experts—to review the video can be much more productive, as a much broader variety of insight and expertise is brought to the table. Of course, understanding an audience in itself accomplishes nothing. We need to use what we’ve learned to make changes that have real impact. And when we do that, we need to think both big and small. Oftentimes, we implement the changes that will move the needle quickly. Then we move on. But understanding and serving an audience is a cyclical, not a linear, process. To make the most of our communications efforts, we need to take data, test assumptions, and make changes constantly.